Baby Wearing Benefits – This sling allows you to carry your newborn in the same position they have assumed in the womb, making it easy for eye contact to bond with your new loved one. The rocking soft, snug feeling of the sling and the sounds of mom’s heartbeat and voice helps calm the baby. Research shows that babies who are carried in a sling cry less, sleep more peacefully, nurse better and gain weight better, enjoy better digestion and even helps for colic and reflux babies. One Size Fits All – Perfect fit for preemies, newborns, babies and small toddlers up to 30 pounds. 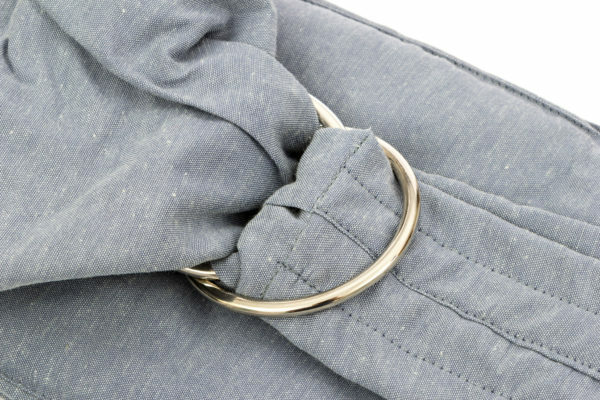 Versatile one size fits all carriers and slings that are quick, easy and simple to adjust using the steel ring in order to carry your child easy and safely. Our new sling can be used by mom or dad and is suitable for a boy or a girl. The perfect baby shower gifts for boys or girls. Super Comfortable – This premium product is made from a high quality material blend of cotton and spandex that allows for elasticity, shock absorption and comfort. 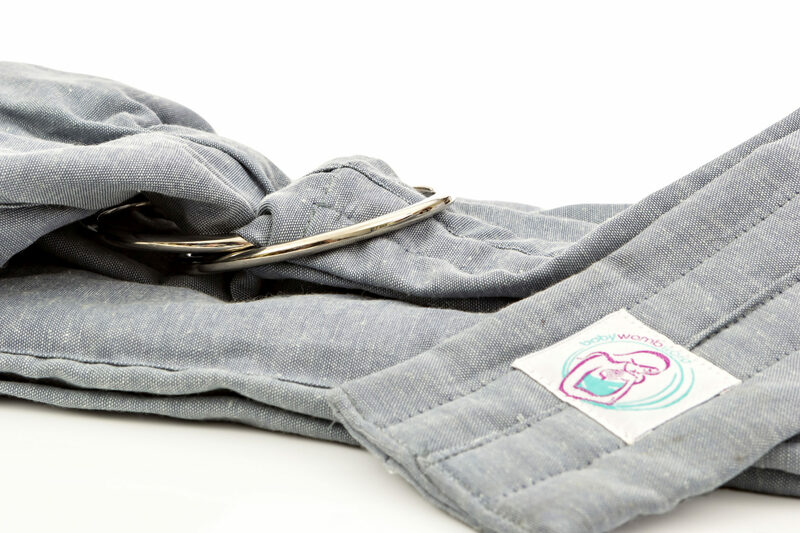 The sling has a single layer of material to make the sling breathable and prevents the infant from overheating. 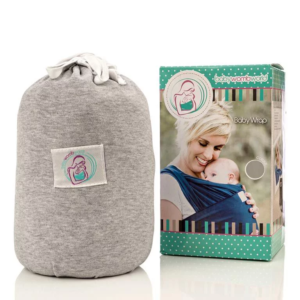 The lightly padded sides allows for light carrying on the shoulder and gives the parent the convenience of safe, hands free nursing. There are a number of different carry positions and is very suitable for breastfeeding. Improved Design – After our first sales on Amazon, our clients have given us feedback as to how we can improve our sling to make it an even a better sling. We have looked at the feedback and came up with a new improved design that has addressed all of these minor concerns. At BabyWombWorld customer satisfaction is our priority and our aim is to always make a positive difference in each parent’s life. Click an item below to view the video. SAFE USE OF ANY BABY CARRIER DEPENDS ON THE USER. ALWAYS PUT YOUR BABY’S SAFETY FIRST. The sling is made for carrying children from their full-term birth until 30 pounds. However, your body may have different limitations. Do not use a sling to carry a child you wouldn’t ordinarily carry in your arms. 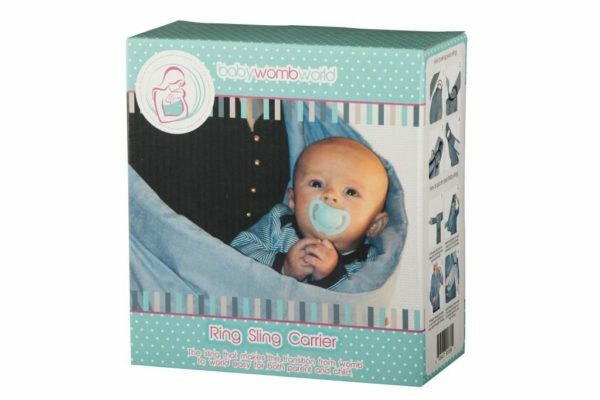 Any carrier should hold your baby the way you would hold him in your arms. Do not use the ring sling to put your baby in a position which you wouldn’t hold him in your arms. Never place more than one child in this sling, or wear more than one sling at the same time. The fabric should always be snug against your child’s body. Examine your sling before each use for wear and tear; do not use if excessively worn or torn. Do not use the sling near open flames or high heat, as the fabric is not fire-retardant or resistant; nor is your baby? A baby carrier should NEVER be used as a child safety seat. The sling may not be used as a car seat in any moving vehicle or equipment. Always ensure that a minimum of 3 Inches of the strap is pulled through the rings. NEVER cover your child’s face with the sling fabric. Newborns and small infants are at risk for positional asphyxia. The weight of your child’s head should be supported, but his neck should be mostly straight at all times. If your child is grunting or seems distressed, reposition him. Infants with respiratory conditions, either chronic or acute, can face additional risks in a sling. Follow all instructions or consult a doctor before using a sling with a baby with health conditions. Be extra vigilant if using a sling with a sick baby. Except when the baby is breastfeeding, you should be able to kiss the top of his head. Do not leave the baby in the sling when it is not being worn. Be aware of the sling tail position: with a long sling, tuck the tail into the body of the sling, or wrap it around the rings so you do not trip over or otherwise become entangled in it. Do not use your sling during any activities that may injure your child, such as while exercising, bicycling, running, jumping, etc. Do not use when drowsy, sleeping, suffering from an illness or condition that impairs balance, taking medication that causes dizziness, or using crutches. Carrying a baby in this sling requires diligence on the part of the caregiver. Failure to pay attention can lead to falls or failure to notice distress. Be aware that your center of balance is affected when wearing your sling, and be aware of objects and/or people around you that can cause harm. The instructions attached to this product must be carefully followed by the user. In particular, the user must ensure that the breathing of the baby is not hampered in any way by the use of the product. BabyWombWorld are in now way liable for any harm, damage, injury or death, which may occur arising out of or in connection with this BabyWombWorld product. BabyWombWorld are in no way liable for any manufacturing defects in respect of this product. Please retain packaging for future reference and the user must make sure to visit our website for further detail. 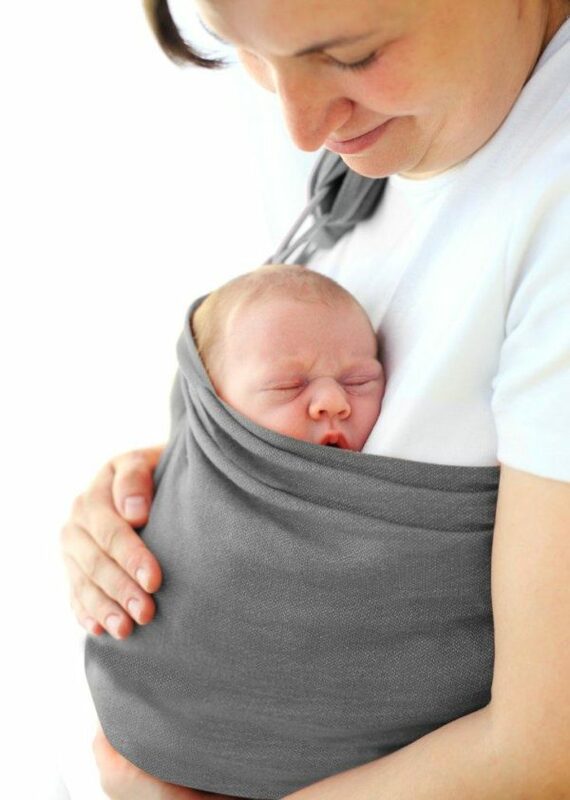 Baby ring sling carrier for newborns, the perfect child carrier that makes parenting easy! Does your baby cry a lot or struggle to sleep? Have you found other carrier difficult to use or struggled to put them on? Does your baby feel overheated and uncomfortable when you carry him/her? Do you have a colic or re-flux baby and you don’t know what to do? 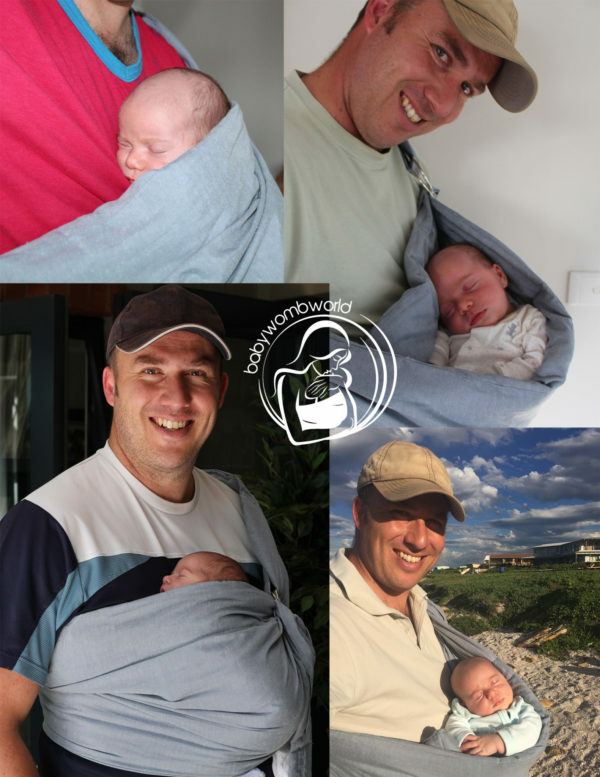 BabyWombWorld has designed a premium baby sling! Quality product that will accommodate the comfort and safety of both parent and child. Research has concluded that mothers who were given soft carriers at birth were more responsive to their babies and their babies were more securely attached. Easy, adjustable one size fits all sling. The sling is just more than 2 yards long with a 16 inch adjustable strap. The end of sling is sewed together in the form of a “belt” to allow for easy set up through the steel rings. One size fits all sling with a fully adjustable strap. Sling can be worn on both right and left shoulder. The extra padding on the sides of the sling does not only giving more comfort to the baby but also makes the carrying the baby light on your shoulder. This sling is really fantastic. I’ve even let my friend borrow it to use with her toddler while we went shopping. My 8 month old remains comfortable while I hold her in this sling. It’s easy to keep clean and really comfortable. I hope it is made in other colors soon, although it is nice to have a gender neutral one. This is exactly what I was looking for when wanting a ring sling. I’ve tried other carriers and this sling is most preferred when at home. I can easily sit with her, feed her (bottle fed, nursing might be more tricky and I didn’t try) and get up when needed for my toddler, hands free! It DOES take some getting used to which the instructions and emails from the company do even say. After awhile it seems like second nature. I love having her in the cradle hold so I can see her face. She just turned two months and I anticipate we can use this sling for awhile. Having the belt rather then loose fabric is so nice. It keeps me cool and I don’t have to deal with a tail. Overall, very cool product! 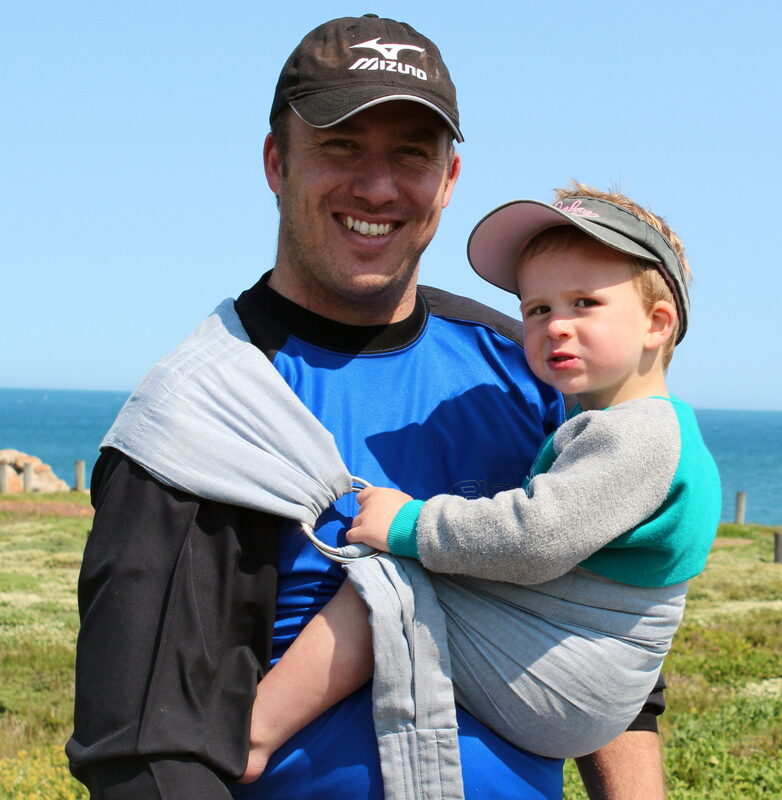 Having used all kinds of baby carriers, this sling is great! I love that it’s padded in the shoulder, and in the carrying area too, so the little gets support and comfort. I like that the fabric is gender neutral, so I can loan it to friends with either gender. My almost 2 year old loved being in it. She loves being worn, and this ring sling is perfect for a bigger child. They can look around and still get those parental snuggles they want. We used it for the first time today and after 45 minutes of walking around the mall, she fell asleep in the ring sling! This sling is so simple and so convenient that I am quite impressed. Made from durable materials that are built to last a long time, the baby sling is worth every penny. I have tried and failed with a lot of other brands and their takes on a “baby sling” but none have lived up to my expectations quite like this one has. It can hold a wide range of many different varies sizes in several amazing different ways. It’s very chic and fashionable, so for all those mommy divas out here–you can hold your baby and still look amazing. I tried this out with my sister’s kid and it just felt so nice, no pressure or painful points anywhere in my shoulders or back. I plan to give my sling to my sister, since my babies are all grow up and no longer in need of a sling. Overall, a very nice product from a very great brand! As a mother and a grandmother, as well as through many years as a day care aide, I have tried a variety of baby carriers. Of them all, this is my favorite one. It is easy to use and provides the support I need to easily carry babies of various sizes. It works well for my 2 youngest granddaughters who are 5 and six months old. The smallest was born 3 months early and has just reached ten pounds. The carrier her parents got at their baby shower did not work well for her t all, but this one is perfect. In addition to babies though, it also works for my grandson who is now 30 pounds. You can use it in three different positions, so it works well for babies and toddlers up to 30 pounds. The padding makes this comfortable for babies and parents alike. 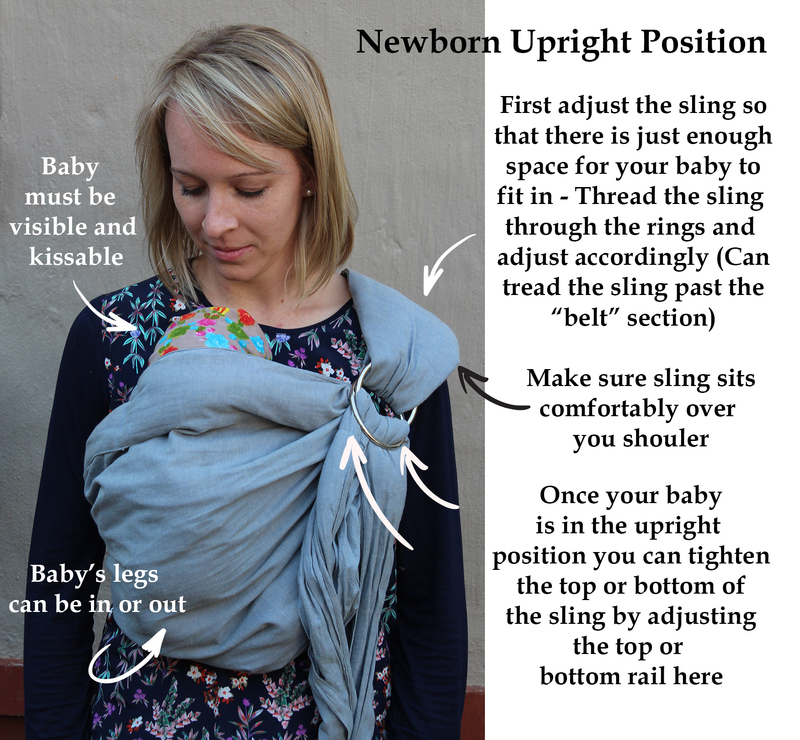 Those who are new to using such a baby sling may need to reference the instructions on their website, but after a few minutes and possibly a couple of tries, anyone should be able to use this sling easily. I love that the website even provides such great instructions (including videos) so anyone can easily learn how to use this wonderful baby carrier. Got this ring sling today and here’s an unboxing video for you. It’s light weight, and very well made. Perfect for first time mom’s and moms who know that’s up 🙂 I love this colour as well and the fabric is soft and definitely not irritating to baby or mama. Two thumbs up from me. This sling is lighweight and easy to use and clean, I love it. This is absolutely a necessity for a new mom with a toddler!! It’s super easy to use and VERY sturdy!! The quality of materials make it easy to use with a peace of mind knowing your baby will be safe to tote around in this sling. Very highly recommended to any new mom or dad!! This baby sling wrap carrier is amazing! It has definitely come in handy with my newborn when I need my arms free to do other things around the house, etc. It’s extremely simple to use, is made of quality material and holds your baby safely and snug. It has a single layer of fabric to make the sling breathable so it doesn’t overheat baby. It has padding in the shoulder and is super comfortable to wear. This sling has five carrying positions and easily adjustable straps. Research shows that babies who are carried in a sling cry less, sleep more peacefully, nurse better and gain weight better, enjoy better digestion and even helps for colic and reflux babies. Very comfortable for baby to sleep in. It is very easy to store and pack away for trips. I don’t think the sling is meant to be used for long periods of time. This has been a lifesaver. I can be sure my little one is protected while I attend to other tasks. It also helps us bond. I see other mother’s who always have their babies in playpens and while there’s nothing wrong with pay pens, this is better for our family. It’s also perfect for events like state fairs and amusement parks. It’s so easy to carry your baby and still have your hands free for everything you need to do. Great sling! I am a huge baby wearing fan and I am always looking for a good carrier to have on hand to be able to gift to women I meet and a sling is an awesome one and this one is no exception! The material is great and strudy as are the rings. With a sling it is just so versatile and you can use it for a long time and I love it. It does take a bit of practice but once you get the hang of it you will never not baby wear!! This one feels really great even with a bigger child (makes sure you check the weight limit on any carrier) and It just makes life so much easier! I cannot wait to find an unsuspecting mom to gift this beautiful sling to her and I will absolutely be buying more of these in the future when I can!!! I bought this sling because I have a very fussy baby who always wants to be held and figured this would help. Each time I searched for help with my baby’s behavior, I would find several suggestions pointing to wearing your baby. It’s super comfortable! My baby loves it too. When I wear it, I can actually get some things done! He is pretty content in it but enjoys when I’m moving around in it as opposed to standing still. He falls asleep in it easily, especially if I’m vacuuming lol. There are some days where I feel like it’s impossible to make him content but then I pull out this sling and it really works like a charm. Also I thought it would be difficult or annoying to put on because it seemed complicated at first. However, you get the hang of it pretty quickly and it’s so easy to do, I can put it on it under a minute now! I love it so much and I highly recommend. I really like this side sling because you can easily put it over your shoulder and adjust the strap. Other ones that wrap around the body look so complicated to me. I do admit it took me a couple times to get baby in the right spot in sling and adjust it correctly on my body. They show detailed instructions in box and there are tutorials on the website to help you if you are confused. The material is very soft and is a pretty blue. My baby fell right asleep in it when I was taking pictures of her in it, so she must have been cozy and comfortable enough. I like that the shoulder pad and sides of sling for baby are padded, which makes it comfortable to wear. This baby sling makes hands free babywearing easy. It feels more secure than the Moby wraps I’ve bought with the overall design of this one. My son is 21 lbs at 4.5 months and fits well in this ring sling.I would recommend this sling overall to any new mother as it’s large enough to grow with baby and strong to support.